I woke up early today as I had to attend classes this morning. As I was on my way to school, I was truly surprised on how high the snow was! 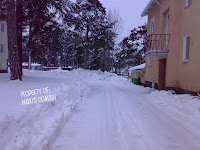 It was a meter high today after the continuous 3-day snowfall. It took me 20 minutes to get to school which in ordinary days would take me only about 5 minutes to walk there. The snow on the walkway was not yet shovelled off on to the side of the street making it so difficult to walk as my feet kept on getting stuck on the deep snow. Sure... I love snow... I love winter but sometimes it just kills me! Anyway, it was a lot better on my way back home as huge cranes had already cleared the way for pedestrians. However, the walkway wasn't sanded yet making it so slippery to walk on. Actually, I almost slipped three times today. I was just thankful that my boots' soles were made of rubber which were really good in functioning as my "brakes" to at least stop me from falling and saving me from embarrassment. Well... well.. I hope that tomorrow is a better day for people like me who do not use cars!